Roland Juno-60 synthesizer advertisement from page 35 of Keyboard Magazine January 1983. This advertisement ran throughout the first half of 1983 in Keyboard. For the month of January, the ad appeared on page 35, but for the rest of it's run (February to June) it ran on page 7. The ad resembles the Juno-6 ad I just blogged about very closely. In fact, a reader already familiar with the earlier Juno-6 ad may inadvertently pass over this one while turning the pages of the magazine. That problem aside, Roland does rightly focus on the Juno-60's main upgrade - the addition of patch memory. They even provide an up-close photo of the memory section of the front panel. Full points for that one. An interesting observation - The Juno-6's I've seen (including the ad photo in the previous blog post) have the words 'Polyphonic Synthesizer JU-6' written on the lower-right side of the front panel. 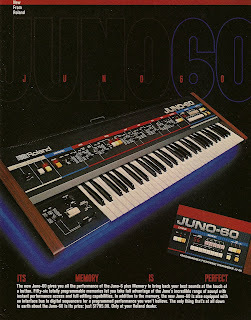 Similarly, the Juno-60 synthesizer in this ad has the words 'Programmable Polyphonic Synthesizer JU-60" written below the memory section of the front panel. But, in some images of the Juno-60 I've seen online, the 'JU-60' is missing. Roland must have dumped that last bit when it didn't catch on. Anyways, one of the best Juno-6/60 articles I've found online was originally published in the September 2008 issue of Performing Musician written by Gord Reid. After a brief introduction and synthesizer history lesson, Gord gets right down to business extolling the virtues of both machines. And its not just the technical references that I like - he's obviously played extensively on both synthesizers and thus is amply qualified to provide some great insight into not only the operation and sonic abilities of each synthesizer, but tips and tricks as well. "In Roman mythology, Juno was the wife and sister of Jupiter. Reflecting this, Roland's Juno and Jupiter families of synths are also closely related. In particular, there are many common components used in the Juno 60 and the Jupiter 8. Both have oscillators built from standard ICs, both have Roland's dedicated IR3109 filter chips, both have BA662 amplifiers, and both have IR3R01 envelope generators. Given that the two instruments reside at the opposite ends of the market (flagship mega-synth at one end versus low-cost, affordable synth at the other), this degree of commonality is remarkable, and it demonstrates that the two synthesisers have much more in common than might otherwise be apparent." Roland was truly the victim of bad timing. As explained by both Gord, and on the Juno-60 Wikipedia page, there is a reason why Roland had to quickly come out with this upgraded version of the Juno-6. Around the time that Roland first released the Juno-6, Korg came out with their more technically advanced Polysix - a similar synthesizer, but one which also including external control and patch memory. In fact, to add insult to injury, when the Roland Juno-6 was first proudly announced in the Spec Sheet section of the June 1982 issue of Keyboard magazine, Korg kicked Roland's own TB-303/TR-606 advertisement out of it's coveted front-inside cover space for that month - a spot Roland had held pretty much exclusively since March 1980. Korg's replacement? Four delicious pages of advertisements. A Mono/Poly ad which folded out to display a two-page Korg family ad inside it, and on the opposite page is the Juno-6's nemesis, a Polysix ad. Roland's engineers must have got the message. They quickly added 56 memory patches and their own proprietary digital communication buss (DCB) for externally control, and screened on a '0' to the end of the synth's name to create the Juno-60. I know I've been fixating on Spec Sheet promos lately. But since I included it for the Juno-6 in my last blog post, I figured I'd end this blog post with the Juno-60's Spec Sheet text. The 60's Spec Sheet promo appeared in the January 1983 issue of Keyboard, the same month this advertisement first ran. "The Roland Juno-60, an expanded version of the Juno-6, is a six-voice polyphonic synthesizer with a programmable patch memory capable of string 56 programs. Like the Juno-6, it has a five-octave keyboard with a seven-octave range, a single digitally-controlled oscillator for each of the six voices, VCF, HPF (high pass filter), VCA, LFO, arpeggiator, transposer, and other features. It also has a full memory protection, a foot pedal option for changing programs, and a digital communication buss with a standard computer connection jack designed to interface the Juno-60 to digital sequencers and other computer-controlled devices. Dimensions are 41" (94 cm) wide, 4-1/2" (10.5cm) tall, and 15" (38cm) deep. The unit weighs 26.4 lb (12kg). Price is $1,795.00. Roland, 1022 S La Cienega Blvd., Los Angeles, CA 90035. "